Adult-film actress Stephanie Clifford, also known as Stormy Daniels, poses for pictures at the end of her show at the Gossip Club in Long Island, New York, Feb. 23, 2018. New documents show a second lawyer with ties to President Donald Trump was involved in legal efforts to keep adult film star Stormy Daniels from talking about her alleged affair with Trump. Attorney Jill A. Martin signed the documents, which were filed Feb. 22 as part of confidential arbitration proceedings. She's referenced in the filing as counsel for "EC LLC,'' though the address she lists is that of Trump's Los Angeles golf club. EC appears to be a reference to a company formed by Trump's personal attorney, Michael Cohen, to facilitate a $130,000 payment to silence Daniels in the closing days of the 2016 presidential campaign. 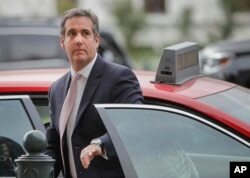 Cohen has acknowledged making the payment, but said he was not reimbursed and denied the campaign and the Trump Organization were involved in the transaction. Daniels' attorney, Michael Avenatti, confirmed the authenticity of the new documents to The Associated Press. The documents were first reported by CNN and the Wall Street Journal. Earlier this month, Clifford filed a lawsuit seeking to invalidate her "hush agreement'' because it was signed only by her and Cohen, but not Trump. She's also offered to return the money she was paid for agreeing not to discuss the alleged relationship. Clifford alleges that she began an "intimate relationship'' with Trump in 2006 and that it continued "well into the year 2007,'' according to the lawsuit. She said the relationship included encounters in Lake Tahoe, Nevada, and Beverly Hills, California.